Alternative Flooring Naturals :- Make an Architectural statement with our extensive natural flooring collection. Choose from a seagrass, sisal, coir and jute fibres and make stunning natural fibre rugs and runners. Invite a world of monsoon-grown grasses, Goan beaches and coconut husks into your home. 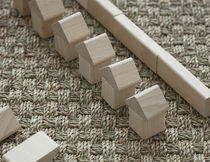 Natural carpets and rugs look stylish and smart.